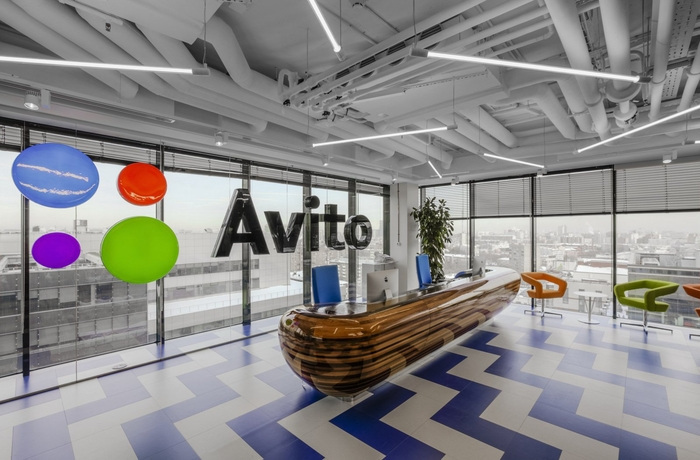 ABD architects has designed the new offices of classifieds company Avito, located in Moscow, Russia. The architects from the ABD architects bureau worked on the design project of the new office Avito Yacht. A part of the spaces on the 10th story is allocated to the working space in the open-space format. The working zones, each being made in light blue, red, yellow and green shades, are partitioned with glass and mobile flipchart walls, and also two-tier soft slipping boxes resembling the hold of a ship. Lounge zones and secluded work places are provided for rest and communication of the personnel. For business meetings and conferences, there are small negotiation rooms called by the names of the famous islands (Wrangel, Kotlin, etc). The yacht idea inspired plenty of original solutions in design, besides all of them have not only the decorative nature, but they are also functional. A winning idea was, for example, the use of sun-screening film, which is used for yachts view ports, for matting the glass walls. You hardly can see what is going on inside the conference room through the light–reflecting film from the outside while everything is seen perfectly well from the inside. The white luster typical for yacht hulls is made with marker paint in the office. As a result, you can draw with a marker on most of the walls. The motto of Avito “work hard –play hard” is realized literally – besides the efficient working zones, there is a spacious gym with a change room and showers, billiard room, a cozy little room with a massage chair, a game room with kicker and a play console, an impromptu climbing wall, seriously equipped “kitchens” with drinks and snacks and spacious full-fledged canteen serving the whole large team. The working zone has a few sleep capsules, where Avito employees can have a rest or work in silence. You can lie or sit inside. There is a soft mattress, ventilation and light. The capsules are located in two tiers, and in the spirit of the marine theme they are called “torpedo tubes” – the entrance into each capsule has a distinctive round shape. The conference center is arranged on one of the stories: the group of spacious meeting rooms with mobile furniture and impressive media equipment allow holding meetings, trainings, presentations. Next to the meeting rooms, there is a convenient hall where you can talk before and after the meeting. The roll-apart partitions allow combining the meeting rooms, the hall and the canteen located near into one huge space, where you can host events for hundreds of guests. In order to modify the canteen hall, you do not have to carry the tables out. Just like on a yacht the sails are lifted up with special winches, the winches lift the tables up to the ceiling in the canteen to empty space for parties and other events.